Related video report by Aru Pande. Against the backdrop of war in Iraq, Yemen and Syria and concerns about Iran’s behavior in the Middle East, President Barack Obama will welcome Saudi King Salman to the White House Friday. It will be the Arab leader’s first visit to the United States since ascending the throne in January, following the death of King Abdullah. The talks between Obama and the king could not come at a more tumultuous time, as a U.S.-led coalition fights Islamic State militants in Iraq and Syria, and a Saudi-led coalition beats back Iranian-supported Houthi rebels in Yemen. “This is an important visit at an important time, with the many developments in the region where we have shared interests with Saudi Arabia and with the recent conclusion of the Iran deal and the follow-up of the Camp David summit with Saudi Arabia and our other Gulf partners,” Deputy National Security Adviser Ben Rhodes said. 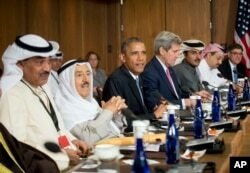 President Barack Obama sits with Kuwaiti Emir Sheikh Sabah Al-Ahmad Al-Sabah, left center, Secretary of State John Kerry, right center, and other Gulf Cooperation Council leaders and delegations at Camp David, Md., May 14, 2015. Friday’s meeting at the White House will be the first since a May 14 summit, during which President Obama spent time with Gulf Cooperation Council leaders assuaging any concerns about brokering a nuclear agreement with Iran. “Many people in the Gulf, in fact the entire Arab World, are concerned about the U.S. position in the Gulf, about the Iran nuclear agreement, about what is happening in terms of Iran’s expanding influence in the Levant, in Iraq, in Yemen,” said Anthony Cordesman, a security analyst with the Center for Strategic and International Studies. Cordesman said dialogue will be critical to building Saudi confidence, particularly in the recently negotiated Iran nuclear agreement. “They have to be firmly convinced the United States is going to enforce it, is not going to ignore any violations, they will take a hard stand on it,” he said. While noting Saudi Arabia has already expressed support for the deal, Rhodes acknowledged Saudi concerns about Iran getting their hands on some $56 billion in assets due to sanctions relief. To that end, White House officials say Friday’s discussions will also center on increased security cooperation to build Saudi capacity in dealing with a potential Iranian threat — but not necessarily through the delivery of conventional large-scale systems and heavy weaponry. “It’s a conversation that we’ve continued under the radar in these working group meetings — really rolling up our sleeves with our experts in departments and agencies to build out a whole range of capabilities in the areas including border security, maritime security, cybersecurity, counterterrorism,” said Jeff Prescott, National Security Council Senior Middle East Director, in comments to reporters. Beyond the nuclear deal, Iran’s behavior likely will also factor into the two leaders' discussion on Iraq. Former U.S. ambassador Francis Ricciardone, now director of the Atlantic Council’s Rafik Hariri Center for the Middle East, said Saudi Arabia has a stake in seeing its northern neighbor stabilized. “I should think the discussion between President Obama and King Salman on Iraq will be very interesting, as to what each side can do to support Prime Minister [Haider] Abadi in holding that country together and strengthening its independence from a hegemonistic influence,” said Ricciardone. Ending the fighting, urging a political solution and addressing a humanitarian crisis are goals both leaders likely will push for, not just in Iraq and Syria, but in Saudi Arabia’s southern neighbor, Yemen, where Saudi airstrikes continue to pound Houthi rebel targets on a regular basis. The Gulf nation has come under fire for its bombing campaign, which has killed hundreds of Yemenis in strikes hitting civilian targets, including a dairy factory and residential compounds. The United Nations says more than 2,100 civilians in Yemen were killed in the conflict between March and July, the majority from coalition airstrikes, for which the United States is providing logistics and intelligence support. White House officials said one can expect an “expression of concern” during Friday’s talks.